I will be visiting Belgium in March to tour the sites of the 1918 Spring Offensive (i.e., Kaiserschlacht). As part of the tour we will be visiting the US War Cemetery at Waregem. To prepare for the trip, I am looking for recommendations on a good general history of the American role in WWI. I have a number of general histories of the war and books focused on the battles in Flanders, but have focused primarily on the British effort. Any suggestions would be appreciated. Happy New Year. Here's just a handful of titles; much depends on what you are interested in. James H. Hallas, Editor, THE DOUGHBOY WAR: THE AMERICAN EXPEDITIONARY FORCE IN WORLD WAR ONE. This is the "grunt's eye view" of the American involvement in the field. Drawn from primary sources written by the participants, lending an impressionistic perspective. Richard S. Faulkner, THE SCHOOL OF HARD KNOCKS: COMBAT LEADERSHIP IN THE AMERICAN EXPEDITIONARY FORCES. Fairly damning work on how U.S. "90-day wonders" as 2ndLts affected infantry tactical proficiency and unit learning. Explains why in World War II the Army generals were so unanimous about never doing this again. Highly recommended if you are interested in the costs of inflating a large army out of nothing in very little time. Mark Ethan Grotelueschen, THE AEF WAY OF WAR: THE AMERICAN ARMY AND COMBAT IN WORLD WAR I. Superseded Paul Braim's TEST OF BATTLE as the best single volume on the development of U.S. Army tactical abilities in the war. Andrew Carroll, MY FELLOW SOLDIERS: GENERAL JOHN PERSHING AND THE AMERICANS WHO HELPED WIN THE GREAT WAR. A solid recent examination of the role of Pershing in leading the American war effort in France, citing the written perspective of many participants. Good collection of excerpts from Pershing's personal papers/correspondence. I enjoyed "To Conquer Hell" by Edward G. Lengel. The Kaiser's Battle was fought to be exclusive of American involvement. You could start by reading between the lines of the flat no-point-of-view Meuse-Argonne account on Wikipedia, starting with the battle's first phase, especially the bit about the 35th Division running out of food whilst attacking. Published in 1918, before war's end, 372pgs of Q&A on all things WWI, foreign and domestic, like a current events review for people wanting to be up to speed for parlor conversation about "the war". I suggest it because it illuminates what Americans knew, were thinking about, were talking about, at the time. ... covers the evolution of US tactical doctrines leading into, through, and after WWI. A fine book on the AEF's war is "Memoirs of My Services in the World War, 1917–1918," by George Marshall. Though written from a staff officer's viewpoint, Marshall's insight and observations of those around him, as well as his revealing a lot of his own feelings make this an engaging and interesting book. Thanks all, I really appreciate the information and I will check out a few of these in preparation for my trip. In addition to visiting WWI battlefields and memorials, we will also be doing many visits to breweries and pubs in Belgium. I'm pretty well covered for reading on that topic. Operarion Michael (Kaiserschlacht) was fought in France not Belgium. Not a book, but highly recommended anyway, is the The Great War channel on YouTube. There are several parts that cover the involvement of the US during WWI. I have listened to Dan Carlins podcast series on WW1 (Blueprint for Armageddon), and found it fascinating! William March was a highly decorated soldier who served with the USMC in Europe during the Great War. He wrote a book in the 1930's about his experiences during this time called 'Company K.' It's an odd little book that has about 100+ vignettes from different characters. william March was often compared as the American equivalent to Germany's Erich Maria Remarque, author of 'All Quiet on the Western Front.' I have no idea if this book is still available, however, it is a first hand account from an American veteran of the Great War. Enjoy your trip. I'm still learning about the subject. I apologize for the inaccuracy. All are worthy suggestions I am sure. And it sounds like a fantastic trip. 1. As to the whys and wherefore's to the conflict, essential background reading is The Sleepwalkers by Christopher Clark. I assume you are at least passingly familiar with the traditional story of the beginnings to WW1 (such as Guns of August by B Tuchman). This is the real story. Or at least the proverbial "rest of the story" on the "lights going out." Also happens to be a fascinating series of events when laid out against the actual timeline. Bit of a dense read as you have to read against that timeline. Lays out important facts only revealed when the ex-Russian (Soviet) archives were (for a short time) open to Western researchers. Not tedious, you just have to pay attention. 2. As to the US Army in WW1, essential reading is First Over There by Matthew Davenport. Details the story of the Battle of Cantigny, the US Army's first battle on its own. Planned by one George Marshall. Yeah, that one. Not only fascinating in its own right, but also gives a good feel for what the guys on the ground were going through, many of them on their way, of course, to places such as Waregem. Well written. 3. Absolute must read on the subject of WW1 is Bruce Gudmundsson's Stormtroop Tactics. Subtitled Innovation in the German Army, this details the huge doctrinal shift in tactical and organizational thinking between 1914. (Personal beef -- imho WW1 was a period of more rapid technological change than WW2. Think about it, at the start of WW2, all the elements of ground combat were already in place. Sure, planes and tanks and small arms got better, but the idea was already there. Not true in 1914, at least to the same extent. No one knew that subs or planes or machine guns were potent weapons, for example.) As Gudmundsson points out, in 1914, the TO&E of an infantry battalion was essentially a bunch of guys with a little artillery thrown in. Recognizable in concept to Napoleon or even Caesar. By 1916, the German TO&E had changed to machine-based combat. A concept recognizable to Rommel and Schwartzkopf but not Napoleon or even Grant. Short little read though a bit hard to get but hugely important imho in understanding what the Germans were doing, trying to do and thinking. Which impacts the story of the US Army experience in several ways. 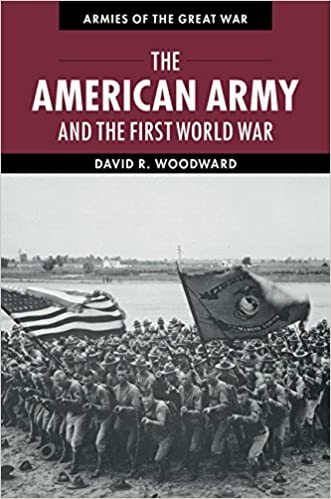 First, given the evolution (revolution) in infantry tactics since 1914, the British and French really did have a point that the US Army was no way ready for the Western Front. Trying to subordinate the US Army to the "professionals" wasn't just snobbery, it was in part tactics. Also shows why Pershing's approach ended up being so bloody. Of course, what the Brits in particular were trying to do was a political non-starter, but the points were not all in Pershing's favor and a lot of doughboys paid for that. Print out and read on the plane. 5. Finally, whatever you do, avoid Catastrophe 1914 by Max Hastings. The author (who is most definitely NOT a historian) has done more to reverse progress in understanding WW1 than any other recent work of which I am aware. Catastrophe may be of interest to specialists as an example of how hard it is for some (mainly British) authors to deal with the real story of WW1 (see Sleepwalkers above), but is not worth the read. Bonus point -- Catch The Great War series on You Tube. WW1 week by week in circa 10 minute increments. Bonus point #2 -- Look up C&rsenal's series on the small arms of WW1. Othais and Mae (I think I am spelling those correctly) are creating the definitive work of firearms history on EVERY small arm documented to have been used in WW1. And she (Mae) shoots the things as well. VERY cool stuff. Sorry for rattling on like this, but hard to avoid a soapbox on one of my favorite subjects. Have a great trip (and let us know how it went)! Apparently the book was published to critical acclaim. And has not been out of print for very long either. Listed as of today available on Amazon. There is even a movie version. Go figure. Not what the OP is looking for but figured I'd throw it out there for anyone interested. Yesterday I purchased the Kindle version of GJ Myer's A World Undone, which is an overall history of the war. It gets great reviews on Amazon and as a bonus it's currently only $1.99.